As you evolve in your fishing abilities, you expect more and more features from your fish finder. But as they run up to thousands of dollars, where do you stop? The Lowrance Elite 7 TI fish finder with TotalScan transducer kit might be your answer. The Lowrance Elite 7 TI fish finder is best served by their TotalScan transducer. This single transducer can handle all frequencies from regular Echo to StructureScan. With all these SONAR technologies, you have a near-photographic view of the underwater landscape. This is supported by basic networking features like the NMEA2000 and advanced sharing features like Wi-Fi and Bluetooth which helps if you fish as a team over a large vessel. The closest competition with similar feature set is the Garmin 7sv but it doesn’t have a touchscreen or Pre-loaded maps and costs almost half of Elite 7 TI. The HumminBird Helix 7 is as exhaustive in its features as the Elite 7 but it does not have the touchscreen. The Elite 7 TI fish finder is better suited for professional anglers but it can fit into the budget of expert recreational anglers too. + StructureScan: 300 (92 m) ft.
We picked up the specific package of the Lowrance Elite 7 TI fish finder with the TotalScan transducer. The SONAR features mentioned here are courtesy of this transducer. The Lowrance Elite 7 TI fish finder is a sleek device in its charcoal gray body. Most of the face is covered by a 7” screen which hits the sweet spot size-wise. There are 4 buttons on the right. The corners have removable tabs which reveal mounting holes. It comes with replaceable highlights on the corners. The rubbery Lowrance logo can be pulled off to access the SD card slot. It is IPx7-rated waterproof. The Elite 7 TI fish finder has a WVGA color TFT touchscreen. It has a high resolution of 480 x 800 pixels. The screen is backlit and can be read easily even in the brightest sunlight. We found the screen responding to touches instantly as a tablet would. Zooming into the images with buttons also happened without lag. The speed of this Touchscreen can convert a button-lover but it can get messy if you fish and operate the fish finder with the same hands. The four buttons are for Pages(brings you to Main Menu), zoom +/-, Power and marking waypoints. This Lowrance fish finder comes with a transom mount for the TotalScan transducer and 24 feet of cable. The unit itself can be flush mounted by removing the corner tabs. Or you can hoist it on the accompanying mount which rotates and swivels fully. The TotalScan transducer connects to the back of the Lowrance Elite 7 TI fish finder through a new 9-pin plug. This transducer is capable of 83/200 kHz for CHIRP and 455/800 kHz for StructureScan all by itself. The unit is capable of 50/200 kHz beams with a different transducer. With the TotalScan Transducer, the Elite 7 TI fish finder scans with an 83/200 kHz dual-frequency beam. It sends 500W RMS power into the water column with a band of frequencies (CHIRP) rather than a single frequency. CHIRP brings more clarity and detailing to the SONAR images compared to single-frequency echoes. With this transducer you get a 1000-foot scanning range. With a 50/200 kHz transducer, the unit can scan up to 3000 feet and can also be used in saltwater. You get both Side and DownScan imaging in this fish finder as opposed to only DownScan on Lowrance Elite 5 HDI. The SideScan throws beams down both sides of your boat. It not only tells you about the structure underneath, it also shows which side of boat these structures are on. The DownScan helps you distinguish exactly whether these structures are fish, logs, foliage or the bottom of the water body. The 455 kHz beams gives the SideScan 300 feet range. At 800 kHz, you get more intricate details but the SideScan range is 100 feet. You can select from multiple color palettes for best visibility in StructureScan. Note that you cannot do simultaneous CHIRP SONAR and StructureScan. The Lowrance Elite 7 TI fish finder packs an internal GPS receiver with WAAS/EGNOS/MSAS precision. You can also add an external antenna. 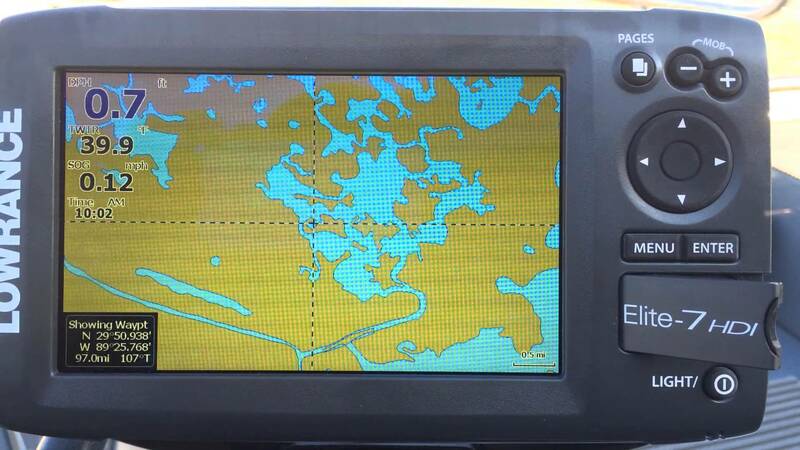 The unit is pre-loaded with Lowrance BaseMaps that cover 3000 US lakes and 1000+ coastal areas. You can buy a Navionics Gold card separately and stick it in the SD card slot to get advanced coverage. This fish finder is also compatible with HotMaps Premium, Lake Insight, C-Map Max-N, Fishing HotSpots Pro etc. Via GPS tracking, you can place up to 3000 waypoints on the maps. These could be fishing hotpots or areas to avoid. You can save them with a description. You also have the TrackBack feature wherein you can go back in the SONAR history of any type of scan (side, down imaging or CHIRP) and place the waypoints on places you have passed. You can also save up to 100 routes and 100 trails. The Lowrance Elite 7 TI fish finder is capable of hosting Insight Genesis, a paid subscription service. This allows you to create your own custom maps using the SONAR images from your device using a Lowrance software. The SONAR images can be overlaid on to existing maps as well. This feature is useful if your area is not properly mapped in the BaseMaps or Navionics. The Elite 7 TI has built-in Wi-Fi capabilities which ease the firmware updates. It can also be used to connect to other portable devices and replicate the screen. You can exploit the Cloud connectivity through their GoFree app. It is Bluetooth-capable too but needs a software update out of the box for this functionality. We did see users complaining about this since this is advertised as a main feature of the product, so it must be Bluetooth-ready right out of the box. This Lowrance fish finder also has an NMEA 2000 port. 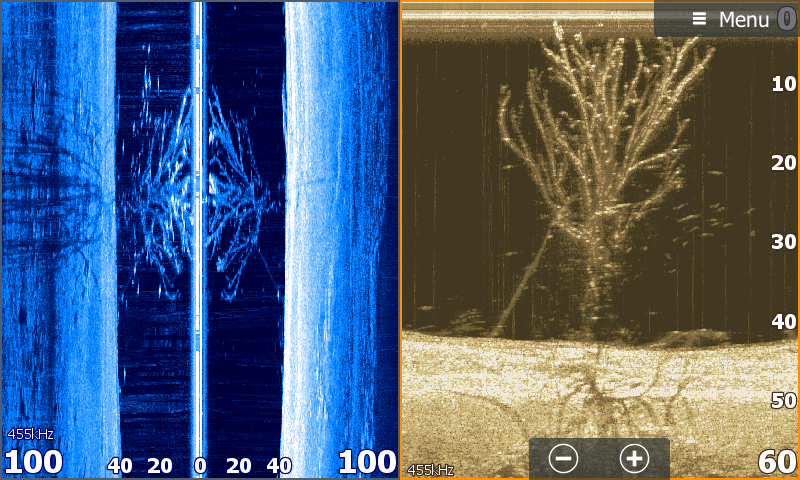 In Elite 7 TI fish finder, DownScan images can be overlaid on CHIRP images to view all fish arches (Like in CHIRP 2D) and also identify different structures (Like in DownScan). GPS Maps and Sonar Images can also be overlaid for location and imaging information all in one place. There are a number of other features which make Lowrance Elite 7 TI fish finders so efficient. These include Fish ID, Amplitude Scope, Alarms etc. The transducer also has a temperatures sensor which can display a temperature graph. A circular flasher function enables the older fish finder technology which is great for shallow water and ice fishing. The Lowrance Elite 7 TI fish finder has a number of preset Views. These are templates with one or multiple windows where you can place screens e.g. SONAR, GPS, Side Scan, Down Scan etc.. This allows you to view them together over split screens. 1. You can short press the Power button to quickly bring up the menu, this includes the Data Overlay options. 2. Instead of using Auto Sensitivity in the SONAR Images, tap on that option and adjust sensitivity manually. Set it to nearly 75% to get a balance of fish arcs and low clutter. 3. Long press on SONAR, StructureScan or Maps to bring up the related split screens quickly. 4. You can capture screenshots of the images of the screen by pressing the Power and Page buttons together. These are stored on the device memory but they can be moved to the SD card memory. 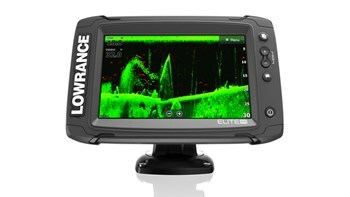 The Lowrance Elite 7 TI is a fish finder with extensive GPS capabilities and wireless connectivity. Its speedy touchscreen combines with button shortcuts for an easy user-experience. The CHIRP and StructureScan are the topmost technologies to scan the surfaces underwater. The Insight Genesis capability and Navionics chips tie a neat bow on navigation. For a higher-end unit, it offers great value for money.